Otaku is a Japanese publication that is especially created for comic, television and game enthusiasts. The magazine keeps you entertained and informed about the latest news and updates from the thrilling world of comics, manga, cartoon, television and games. Otaku Magazine is a Japanese publication that is especially created for comic, television and game enthusiasts. The magazine keeps you entertained and informed about the latest news and updates from the thrilling world of comics, manga, cartoon, television and games. The literal meaning of Japanese word “otaku” is obsessive or passionate. The magazine justifies its name as being highly addictive and loved by the manga, anime and gaming fans. Apart from news, Otaku magazine also comprehensively features honest and helpful reviews of the latest game, TV shows, anime and manga. Each issue has over 20 reviews that even include the music and film reviews. With 6 issues in a year, Otaku magazine is most loved by youngsters as it provides entertaining stuff on their favorite mangas and anime. The magazine also features the details of the various shows and events that are being organized worldwide. The Otaku magazine has amazing pictures of animation that are related to animated movies, cartoon characters and manga characters. As the magazine serves a quirky sneak peek through the previews of the TV shows, the magazine also has well explained and honest reviews of the recently launched video and computer games accompanied with complete technical and hardware requisites and actual screenshots from the hands on session with the game. 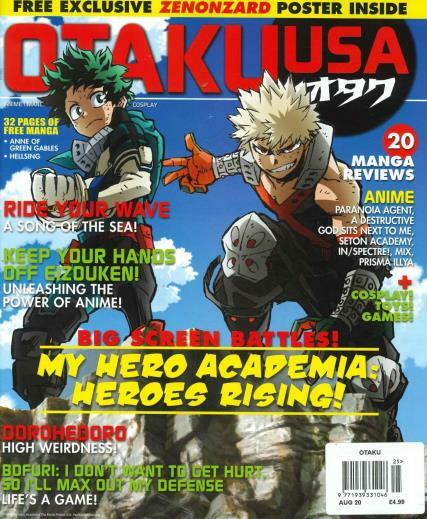 The Otaku magazine is often packed with action packed previews of the popular television series. Anyone who is truly, madly and deeply in love with anime, manga and cartoon can never afford to miss a single issue of the Otaku magazine. The Otaku magazine can be subscribed to keep your regular feed of fun and entertainment posted to you promptly. The subscription to the Otaku magazine is cost effective and fast. Subscribe the Otaku magazine today and you will never miss the thrill and action in your life.